E-Marketing Manager (EMM) employs the latest software technology and database systems that is designed for high degree of stability and scalability. This makes EMM ideal for campaigns that are large and complex to individualize. Especially in e-mail marketing it is important to use powerful technologies because a lot of data has to be processed, content must be customized and thousands of e-mails have to be produced and sent in a short time. E-Marketing Manager generates ready-to-send personalized e-mailings from mailing templates that you have created. 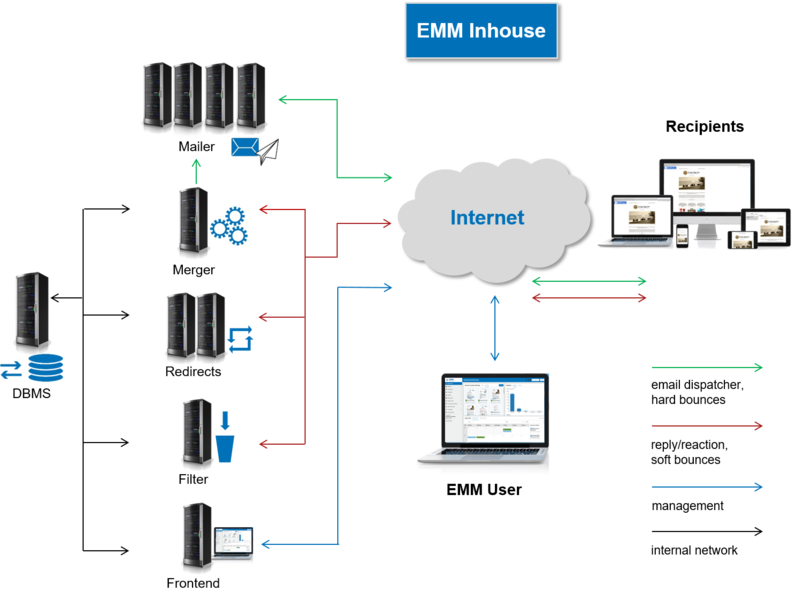 Subsequently, EMM carries out the high-speed transmission via the MailGun, assesses the response to the mailings (openings and clicks) and supplements and/or changes the profiles in the database accordingly. For EMM (SaaS) we use professional branded enterprise-class servers running the Red Hat Enterprise Linux operating system for all mission-critical applications. 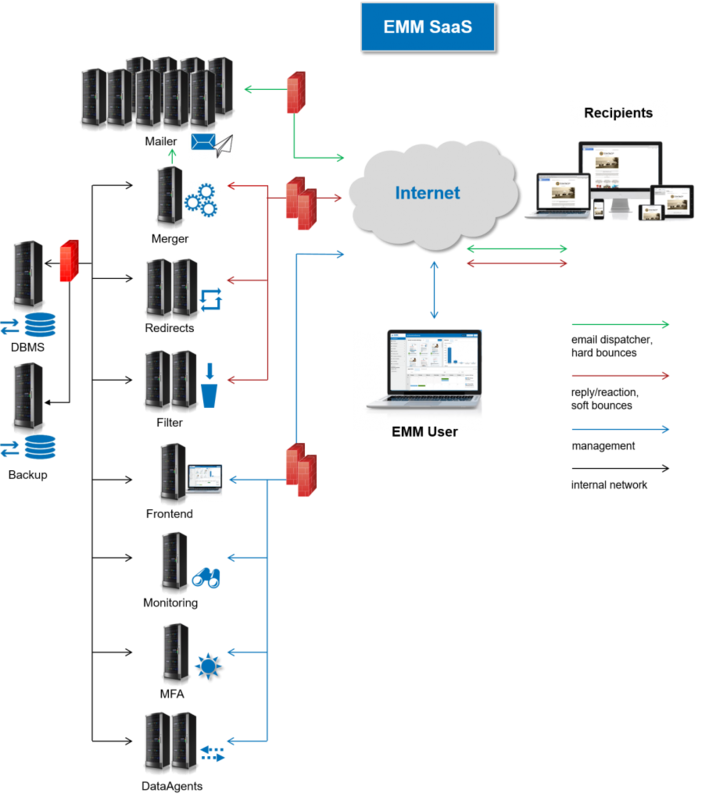 The EMM mail engine, which can theoretically send an unlimited number of e-mails in parallel, is used to generate and distribute mails. The AGNITAS servers are located in an ultramodern data center in Munich that is connected to two electricity grid systems. The data center is equipped with air-conditioning systems, uninterruptible voltage and redundant power supplies, emergency diesel generators, an early-warning fire detection system as well as a fire alarm system and an inert gas fire extinguishing system. The connection to the Internet is made redundantly via multiple lines of 100 MBit to 1 GBit. For us, the subjects of data protection and data security have of course the highest priority. 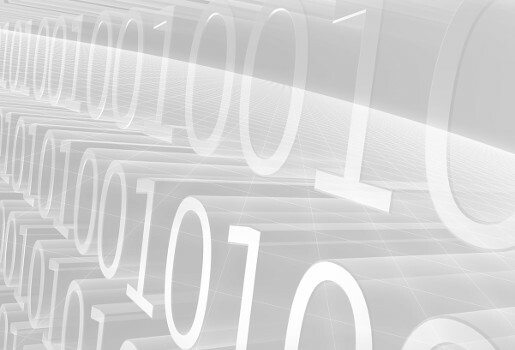 Read more about the physical, electronic and legal measures that we take to protect your data. EMM (SaaS) exclusively utilizes the powerful Oracle database system and guarantees the highest performance even for huge sending volumes. The free Open Source database system MariaDB is particularly suitable for a data and sending volume of up to around 2 million recipients. The free Open Source database system MySQL is particularly suitable for a data and sending volume of up to around 2 million recipients. The powerful Oracle database system for the highest achievable performance even with data and sending volumes over 2 million recipients.